DO YOU HAVE A BROKEN BRAIN? This seems a strange question but this invisible epidemic affects nearly 1.1 billion people worldwide -- one in six children, and one in two older people. One in four will be crippled by it during their lifetime.  Are you depressed, feeling down, and don't have the drive to do anything?  Do you find it next to impossible to focus and concentrate on tasks?  Do you find it hard to remember names or where you left your keys?  Do you get anxious, worried, or stressed-out frequently?  Does your mind feel foggy, unable to experience the world clearly? All is not lost. 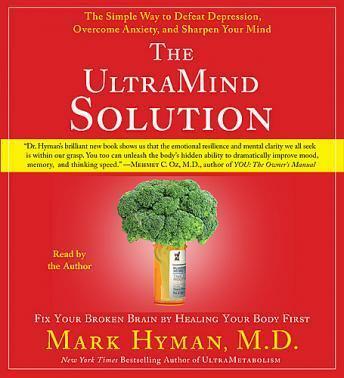 Three-time New York Times bestselling author Dr. Mark Hyman unveils his groundbreaking program that shows how we can fix our broken brains by healing our bodies first. Based on the emerging field of Functional Medicine, Dr. Hyman presents a simple six-week plan to restore health and gain an UltraMind, one that's highly focused, able to pay attention at will, has a strong memory, and leaves us feeling calm, confident, in control, and in good spirits.